I have been excited about trying a Syrah from Edna Valley for a long while. After all, the area has been known for Pinot and Chardonnay for a long while and if those cooler climate varieties can be so successful there then Syrah should be also. One of the first winemaking regions in California, the Edna Valley seems to have fallen out of favor in recent years and is flying under the radar, which may account for the lack of Syrahs that fall to retail outside of the Paso Robles/Central Coast region. 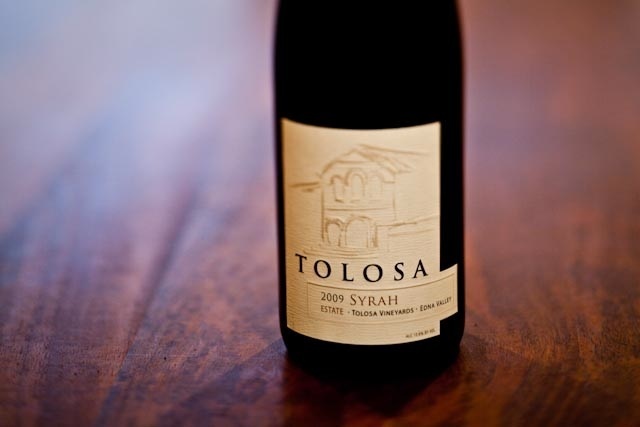 Tolosa was one that I noticed at K and L Wines and decided to try out as an indicator of what’s going on with the region. The Tolosa winery itself has been around for a while and is most well known for its Chardonnay. It’s a label one notices a lot at grocery stores and wine shops. The Syrah is less available because it’s a struggle to get the grapes riper. Day 1: The wine is almost like a combination between cool and warm clime characteristics. It’s got some of those darker flavors and aromas that I might associate with warmer climes but it also has a brightness and freshness that I associate with cooler climes. On the nose the wine has a lot of blackberry pie, vanilla, and bacon fat. On the mid-palate, it’s lighter than you would expect and those aromas give way to flavors of spicy orange rind and a bright finish. The good news is that this is good stuff without a hint of alcohol, the bad news is that it doesn’t have as much complexity as the other cooler-climate Syrahs because it lacks in some of those off fruit flavors. It’s a good wine though, and that price point makes up for that lack of complexity. Day 2: I love to show how the wine changes over time, so for this blog, I usually try to let the wine rest over night and taste it again the next day. I don’t taste the wines in a moment of time but rather as most people drink them – over time. This allows me to see how they evolve with air. And boy, do they evolve. This wine is another example of that. The aromas on Day Two were markedly different: more off-fruit aromas like celery root, licorice, and a bit of black olive. The vanilla and bacon fat aromas are gone and the wine has become much more my style and more of a cool-climate style Syrah. The mid-palate still has some freshness but it’s rounder on the finish and if anything, the wine has gained some elegance. Wow, has this wine changed; I liked it at first but now I love it. This Syrah was made in a very hands-on style. Many of the wineries that I’ve written about on this blog often pride themselves on their “Let the vineyard speak”- hands-off approach to wine making. Not so with the Tolosa Syrah. It’s ironic that this post comes so quickly after my AmByth post in which I extolled the virtues of a non-interventionist approach to wine making. To be clear, I’m not necessarily in the camp of Natural wines, although I admit it’s easy to get caught up in the logic of letting the vineyard speak for itself. But, if the wine needs help to bring it into balance because of weather conditions then I’m willing to give Tolosa a pass. My only caveat is that even though I believe that this wine is very good, I do look forward to tasting it in another less-challenged vintage in which the wine was not threatened by weather. All the manipulation (although seemingly necessary) makes it difficult to say whether or not Edna Valley really makes a great place for Syrah. The suggestion of greatness is there but I’ll withhold judgment. And in the meantime have another glass. I tasted the AmByth Estate wines at last year’s Rhone Rangers event in San Francisco and I remember being absolutely shocked at how different they were than anything else there. Most of the wines I tasted at the annual event struck me as similar — many were rich, oaky, and port-like examples of Syrah with few standouts. Then, I hit AmByth, and the minute I smelled the wines I knew they would be different. You could smell the intense acidity on the nose, and on the palate the wines had a ridiculous amount of acidity. Now, I like acidity in wine but I’ll admit, even my palate was a little shocked at how unique these wines were. Even the drunk guy standing next to me echoed my thoughts by slurring to the winemaker that he had “…no idea how different than anything here…” his wines were. I agreed, and luckily for us, so did Phillip Hart. In fact, it turns out, he was proud of it. On a recent trip back to the Bay Area from a wedding in Pismo Beach my wife and I decided to stop by AmByth Estate to get a sense of why and how their wines tasted so unique. Mary gave us some directions and we tentatively wound our way through the back roads east of Templeton, CA. After having missed the turn off once, we finally made a right turn on a road that looked like it was quickly heading to nowhere. Luckily we spotted the little AmByth sign on a telephone pole and we made our way up the hill on a dirt road through olive trees and vineyards that looked like no others in Paso Robles. We summited the hill to our first views of the architecturally stunning winery and Hart house. Mary met us at the winery and started tasting us through AmByth’s unique portfolio. Head trained Syrah vines growing in unmowed, untilled rows. Phillip and Mary Hart began AmByth Estate wines back in 2008 and have little by little been creating some buzz in Paso Robles. Phillip came to the wine business from a wine connoisseur’s perspective and after years and years of drinking wine from all over the world, he values wines that match well with food and aren’t cloying or over-wrought. They both pride themselves on being original. 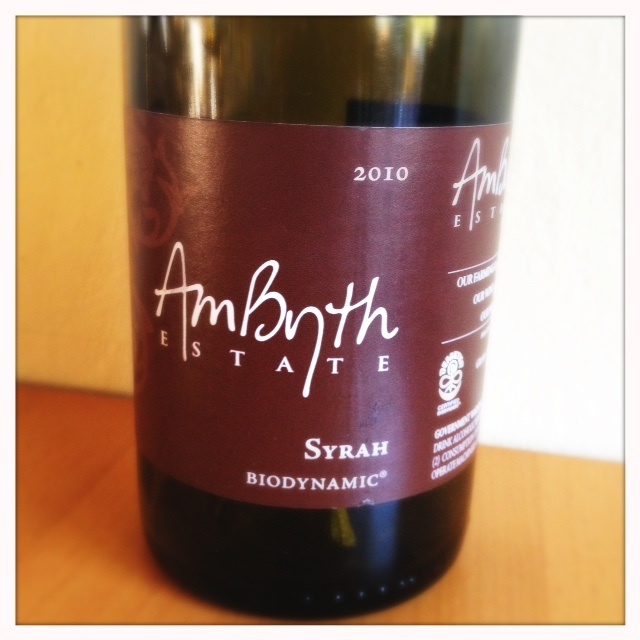 AmByth is the only certified biodynamic wine in Paso Robles and releases purely estate wines. Phillip and Mary have embraced the Natural wine movement in all its permutations. 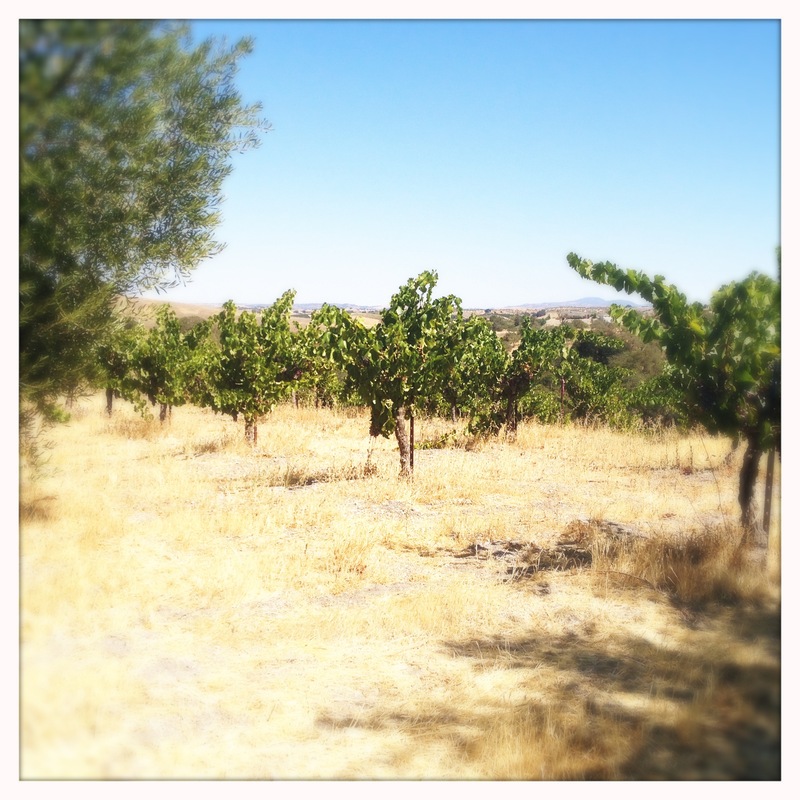 Their vineyards are dry-farmed and head trained, which as you can see in the picture, look strikingly different from other vineyards in Paso Robles. Their wines are fermented with natural yeast, they are either sulfite-free or low in sulfites and of course have no added sugar or acid adjustments. They are experimental (they have an orange wine and are awaiting clay fermenters to make a carbonic macerated wine this year) and as became evident during a recent visit, they believe in having a lot of fun with what they’re doing. So, why am I writing about a wine that technically isn’t cool climate? Well, the truth is, what Mary and Phillip are doing in Paso is such a unique departure from the status quo that I felt like theirs is a story that just needs to be told. And, their wines taste cool climate. They even have more acidity than most of the cool-climate Syrah that I’ve tasted for this blog. And, they’ve just started making a 100% Syrah, so it seemed like an opportunity that I couldn’t pass up. When I arrived at the winery my first question was how is it possible to get so much acidity from an area that traditionally has been so super ripe? Their simple answer was, “Well, we pick earlier than anybody else.” Phillip expanded, “Actually, we pick normal.” Phillip and Mary pick their grapes at 22 to 24 brix, which, in their opinion, should be a standard sugar level for most grapes. Most wineries in Paso wait until their grapes reach much higher sugar levels. My second question was: why do they pick at a “normal” brix level when everybody else waits until their grapes reach higher sugar levels? Mary’s answer was enlightening: In order to make wines that are sulfite-free and will still last in the cellar, they need the acidity to act as a preservative. This is why farmers historically picked at 22-24 brix. In their opinion, many wineries in Paso and other warmer-climes wait too long to pick and therefore create untenable wines which are completely out of balance. In order to get the wines back into balance, the winemakers have to resort to adding tartaric acid into the wine after fermentation. This process results in wines that, according to Phillip, are ultimately too sweet, un-ageable and aren’t particularly food-friendly. I also wanted to know how Phillip responded to the question of complexity in wine. Some would say that by picking “early”, the grapes don’t have a chance to develop the full complexity and aroma (otherwise known as phenolic ripeness) that they do if left to hang longer on the vine. He also had a theory ready for that question; wines that are farmed with irrigation and fertilizer probably do need a longer hang time to develop phenolic ripeness. Dry farming concentrates flavors in the grapes and a lack of potassium-based fertilizers forces the pH levels down in the grapes, consequentially they reach full flavor and aroma potentials while still retaining acidity. So Phillip’s biodynamic vineyards develop that complexity of aroma and flavor because of their lack of fertilizer and use of irrigation. Phillip also pointed out that many commercial wines, when chemically altered in this way, end up tasting the same. Syrah tastes like Cabernet and vice versa. In his opinion, natural wines picked at a “normal” brix level allow the varietals to express their uniqueness through the wine. My tasting at AmByth bore this opinion out: while the wines all were similar in their intense acidity, they were also are very much varietally correct. Their Zin tastes like Zin traditionally tasted in California, their Sangiovese actually tastes like Sangiovese instead of the usual light and overly fruity examples that I’ve tasted from California. Their Grenache Blanc is spectacularly bright and aromatic. The wine: As I mentioned before, this is a wine with some serious acidity and it definitely needs at least a day open in the bottle. Phillip actually didn’t want me to drink this wine for at least another year but I wanted to do this blog post while my visit to the winery was still fresh in my mind. I opened it one day and after a glass of extremely acidic wine, I decided to let it sit on the counter for a bit. The next day I could tell that this had been a very good idea. The fruit came through a lot more and the acidity softened. There is a smoky element on the nose as well as bright pure plum aromas, and a bit of licorice. Surprisingly, there is also a bit of a minerality, which I rarely get from Paso wines. The nose is elegant and light on its feet — there’s nothing thick or cloying about this wine. On the palate, the wine carries that brightness through. The mid-palate is a little lighter than the Syrahs I’m used to and almost has a more Pinot-like weight to it. There’s some strawberry and more minerality through the palate and a bright finish with a touch of salinity. This is a wine that can be aged for a long time. It should be decanted or at least left open to calm its acidity a bit but that patience is rewarded in a wine that’s aromatically intense, complex and food-friendly. As I further explore the world of natural wine, I’m struck by how much texture and originality the wines have. They aren’t all hits but no one can knock them for tasting the same as all the other wines out there. Phillip and Mary Hart have embraced that individuality and continue to run with it. I’m no natural wine convert and I still don’t fully believe in biodynamics but talking to Phillip and Mary for even the short hour that I spent with them made me interested in finding more of these types of wines. It seems to take a certain type of person to make natural wines, someone who isn’t afraid of being experimental and has a little bit of counter culture sensibility. The back roads of California is a perfect place to search out people like these and I’m looking forward to my next encounter.